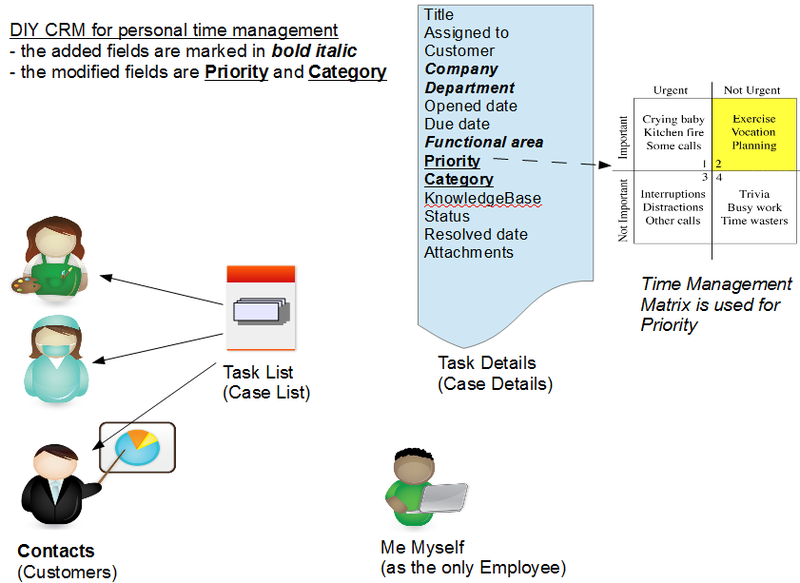 This is continuation to DIY CRM: part 1 for a small team, where the MS Access was used as a simple tool to keep track of tasks or cases for a team. 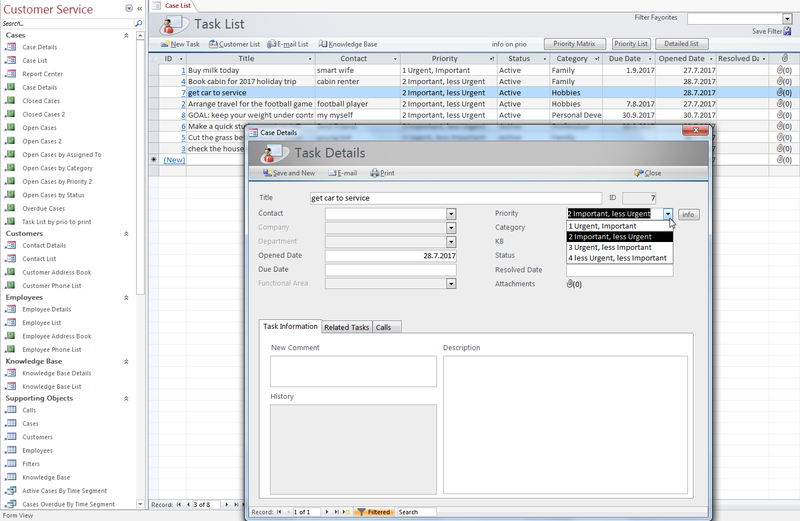 The same tool can be used for a simple personal task management or time management. It is focussing on maintaining the list and priority of the ongoing tasks, and this can be both work and private related. For added security, it is possible to encrypt the file (menu option File->Info). The figure below shows the main concepts. The screenshot below shows how 8 tasks could look like. Task 7 is opened, and in the details form one can select the details like Priority. If needed then these values can be modified. 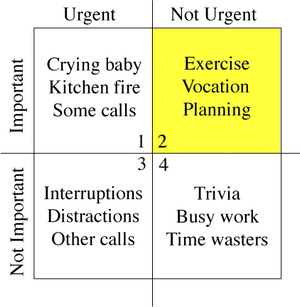 There are several articles about time management. As a reference, the picture shown in Wikipedia is used. The screenshot below shows the new report called “priority matrix” in the Task list or “Task list by prio to print” if looking the reports listed in the left menu. 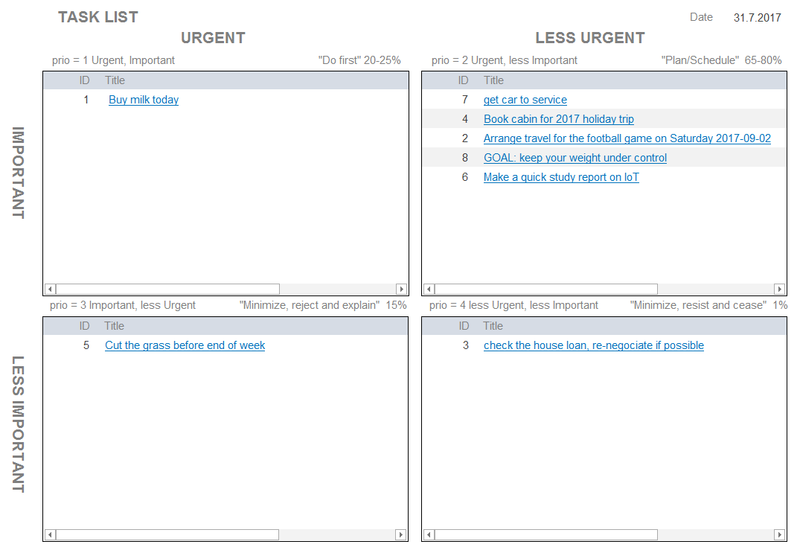 In addition to tasks, one could also list here the main personal goals so that they are always visible (see task 8 below). This entry was posted in Anvanced Tools, Basic Tools, DIY, ICT Leadership and Management, Personal Development, Recommended Free Tools, Tests, Tips, Tools. Bookmark the permalink.